Here is the link for Google Play! Got taken by the white rabbit of Alice in Wonderland――then you became the queen of the fairy tale world! 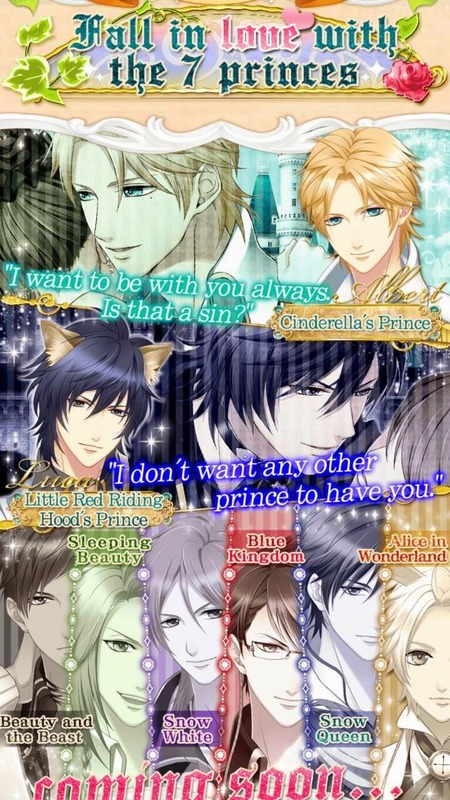 The forbidden love♥game with seven princes from fairy tales has finally been released! Before the due date of tasks, you were so tired and nodding in the office. All at once a white rabbit appeared in front of you! The rabbit took the document there and then started to run away. When you woke up, you realized where you were was a castle!? 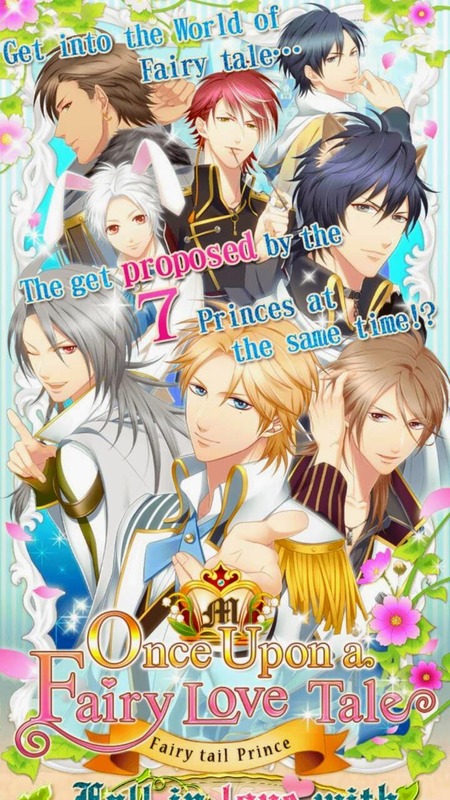 In the Once Upon a Fairy Love Tale, the seven princes from the famous fairy tales showed up! "I would like to be with you forever. Can I hope this...？"
"I told you that I fell in love with you at first sight, didn't I? so I won't let you go to other princes." "Don't touch me too much, I might be under an illusion……"
"Don't forget that from the moment when I met you for the first time, you belong to me." "What do you want me to do for you? Well, OK, I'll love you more"
"What a nice reaction. Queen, I feel like I really want to……harass you"
"If I was your lover, would you depend on me……？"
"Tell me anything. I am here for you." 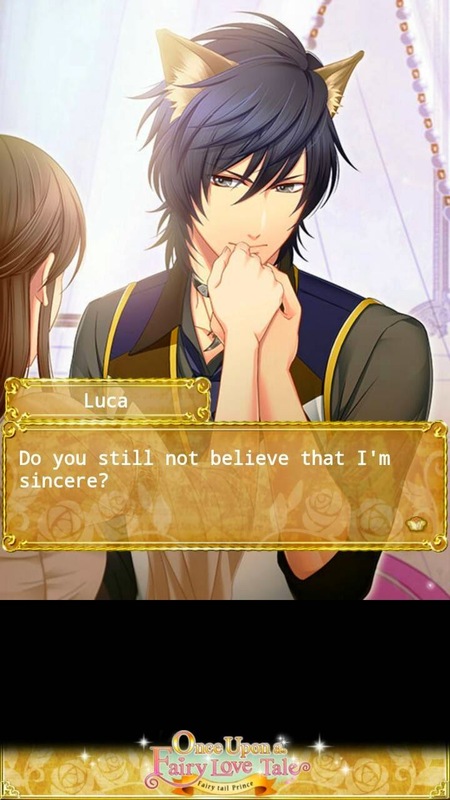 The splendor love♥dating game on the fairy tale world with lots of handsome characters! Go to [Menu＞My Data] and register your birthday then you can see the free horoscope fortune teller everyday. Check the fortune of the day which the prince tells you. 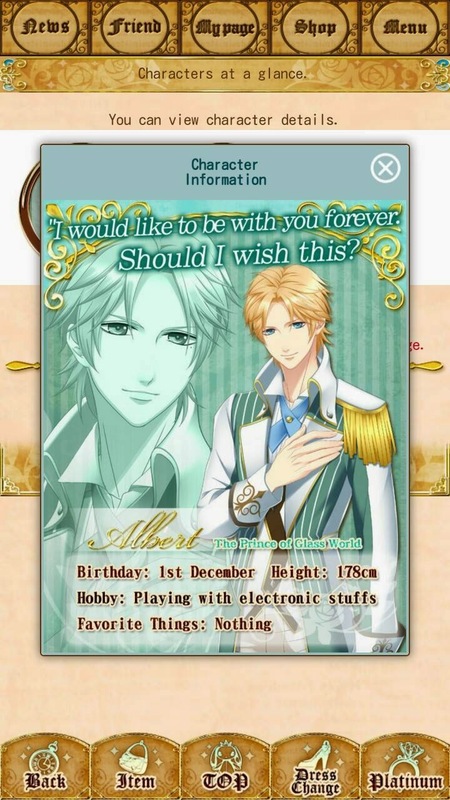 By registering your birthday, you can get the special message from the prince of fairy tale in your birthday! The horoscope fortune teller shows the ranking of the day's fortune for the 12 astrology, total fortune, work fortune and love fortune! Moreover, the lucky color and item of the day. It's simple even though you are playing this for the first time! 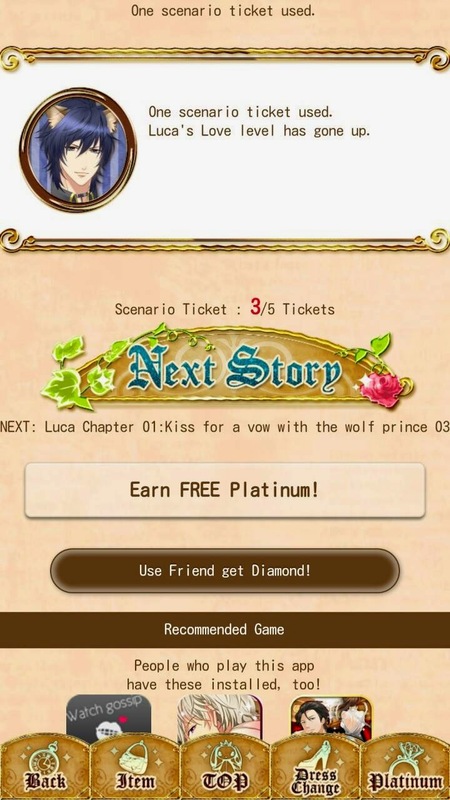 Use the story tickets which will be provided everyday, and progress the story. You can progress five stories per day. Moreover, by login everyday, you can get useful items for progressing the game! If you faced with a Love Mission in the middle of the story, co-operate with your friends and do the Love Lesson then gather&save the Elegance points! 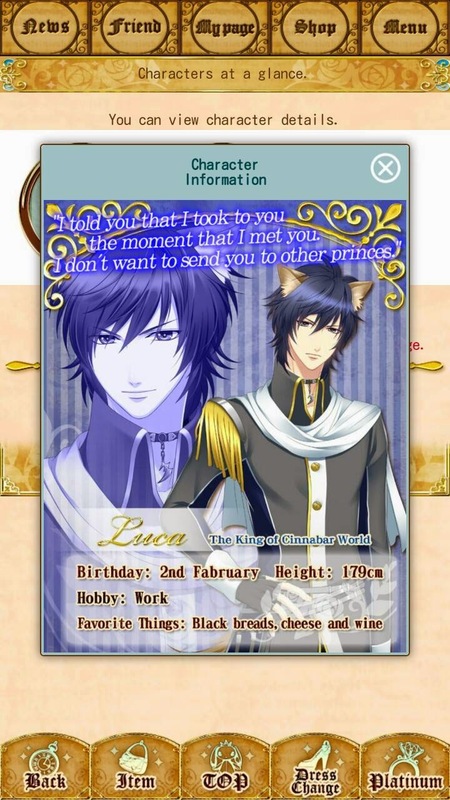 This love♥dating game has lots of events, cute and lovely avatars so you can play with them as well! As a princess, dress up and get more and more friends. The Limited-time offer event provides special stories and luxurious avatars! Not only the princess avatar, but also you can play with the prince avatar! ※Basically, it is a free game. However, there will be some (LOL) charged items which will help you to progress the story smooth. Stupid MC! 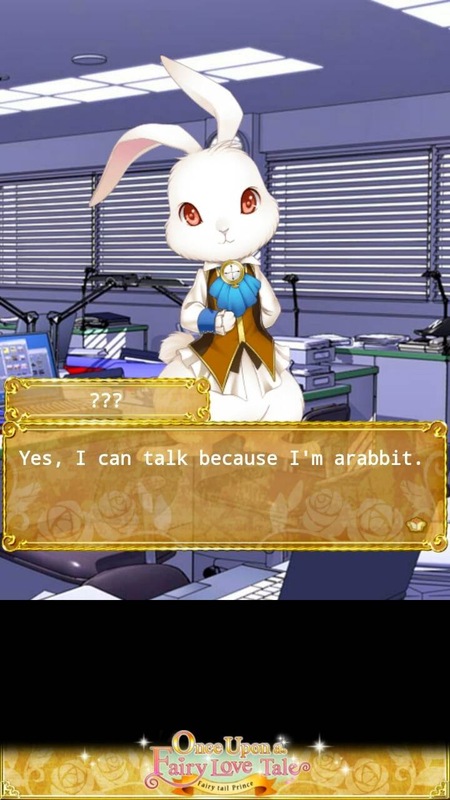 Of course he CAN talk since he is a rabbit! DUH! OMG!!! I did not see this game on google play, thanks for the tip! !